Yakovlev Yak-42D ER-YCA (c/n 452042430617) at Amsterdam IAP in Feb.2003. 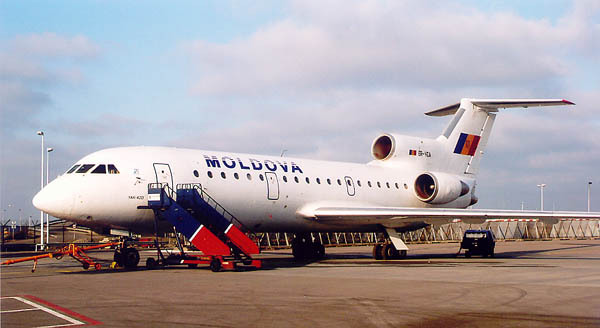 Air Moldova International is a sister company of Air Moldova, which operates with a fleet mainly consisting of various Antonov prop transports and Tupolev 134s; two Yak-42s, ER-YCA and ER-YCB, are used by Air Moldova Int'l on international routes. "Your information about Air Moldova (AM) and Air Moldova International (AMI) is wrong: AM and AMI were always completely different companies, AMI was NEVER a sistercompany of AM. AM is a government controlled company and AMI was a completely privately run company. In, I think, 2002 AM wanted the rights from AMI for the very profitable route KIV-FRA-KIV and forced AMI out of business. Finally AMI gave the rights to AM but the German government subsequently refused to give the landing rights to AM because an owner of AMI (Unistar Germany) complained with the German government. In 2008 the international court decided that Moldova had to pay Unistar Germany a compensation of 6.7 million Euros because it was unlawfull what the representative of Moldova did against AMI." 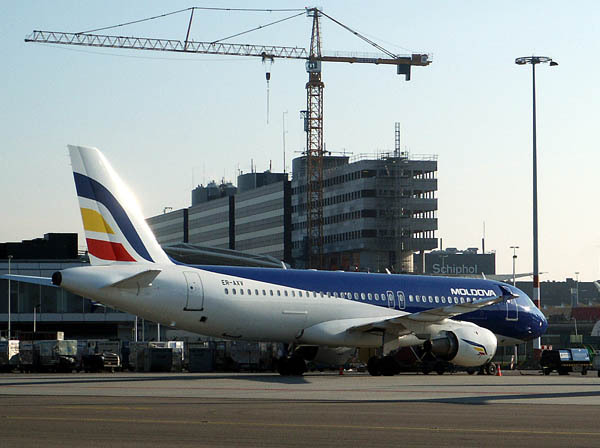 Air Moldova has leased this former Airbus A320-200 ER-AXV (c/n 622) for use on international routes from its homebase Chisinau, to major European cities. Destinations include include Paris, Rome and as seen here on 09Nov03, Amsterdam. The lease started in Sep03 and introduced this lively colourscheme.